Spectaculaire front de mer d'Oahu pouvant accueillir jusqu'à 8 personnes - "Hale Pohaku"
"Hale Pohaku" - Waimanalo est une belle maison en bord de mer sur l'une des plages les plus spectaculaires d'Oahu; Waimanalo. 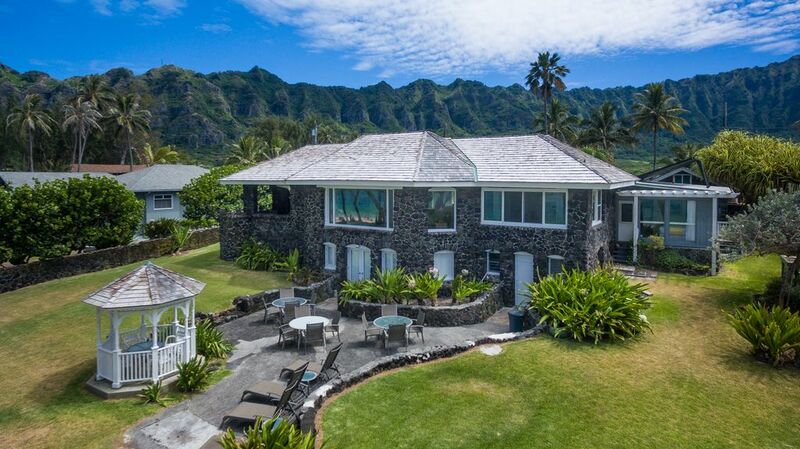 Inscrite sur le registre des maisons historiques d'Hawaï, cette maison de plage restaurée classique a été construite en pierre de lave pendant le règne du roi Kalakaua. Les clients apprécient la plage de sable blanc qui fait face à la maison ainsi que les eaux bleues claires pour la baignade, la plongée en apnée et le boogie boarding. Appelé "Hale Pohaku" ou "Maison de Pierre", cette maison peut accueillir 8 personnes et est une merveilleuse escapade tout au long de l'année. Vous pourrez profiter du salon spacieux doté d'un plafond voûté classique et d'une grande baie vitrée donnant sur le Pacifique bleu. La plage donnant sur la maison est sûre pour nager et la plage de sable sucré s'étend sur 5 miles de se promener et explorer. Notez s'il vous plaît; Il y a un cottage de gardien séparé avec entrée privée également situé à l'avant de cette propriété (pas intrusive pour les clients de location)! Cette propriété est un permis d'utilisation non conforme à court terme de location de permis # 90 / TVU-0235. Cette propriété est conforme à la législation de l'État d'Hawaï (HB2078) pour les locations de vacances, numéro de permis TA-059-395-6864-01. The house and neighborhood were amazing. Quiet, clean, seemingly safe. Sure, it shows its age. But it has all modern amenities to allow you to have a great stay. Spacious and clean home. By the way, if you are on vacation you should be outside the majority of the time anyway! Back yard is great for exercising prior to a run on the beach. Oh yes, the best beach anywhere! Beach was spacious, clean, and conveyed sheer beauty. Honestly, we did not want to leave! Thanks to the owners (as well as Jeremy) who allowed us to have an incredible visit to Paradise. Thank you George. It was a pleasure having you with us in Waimanalo and we are glad you and family enjoyed your stay. Thank you also for leaving the home is such great shape - would love to have you back, any time! Jeremy/Private Homes Hawaii. Hale Pohaku is not just a vacation home; it offers you the true Hawaiian experience. I believe Hale Pohaku was the first house built on Waimanalo Beach. There is a sense of timelessness here, and peace. The view is extraordinary, the garden lush and the location ideal. I loved the artwork and flowers throughout the house. Furnishings are comfortable. The house is very clean, and the appliances seem new. The beds are wonderful, with fine linens and good pillows. You will fall asleep with the sound of the surf, lulled by the breeze. The property manager was very responsive to a few questions I had. My only small quibble - the kitchen knives were not sharp. I would love the stay here again the next time I visit Oahu. thank you for your feedback Nancy - we will have those knives sharpened! Look forward to having you back soon! Thank you for your 5 star review! Loved having you guys and hope to have you back again soon. Happy Holidays, Jeremy. Thank you Gene and Mary for your kind words and excellent review. Mostly, glad to hear you enjoyed your family time in Hawaii. We hope to have you back for your 9th visit to the islands! Best, Jeremy. Thank you Chris - it was great to have you and we look forward to your return soon! Our family recently stayed at Hale Pohaku and it was a dream vacation! Waimanalo is a very quiet town with white sand beach (No Rocks, No Coral, No Currents, Small Waves, some Jelly Fish) and it was perfect to relax from sunrise to dusk. Hale Pohaku property was just as described, it was very clean and sizeable. The layout was great with spacious living room with big windows, all bedrooms have AC. the bathrooms, kitchen, laundry area were good, and for kids the WiFi worked just fine. The ocean view and having the beach just a few steps away was the highlight of every morning. The Property Manager and staff were very helpful (even brought us delicious bread pudding) and the caretakers that live on property were very nice. Thank you for your kind review. Glad to hear you enjoyed this part of the island. Waimanalo is definitely a special place in paradise. Please let us know the next time you are planning a trip to the islands - would love to have you back!